I took this photo the day before Christmas. My brother had taken my little niece and me fishing at the family farm he now owns. It was a clear day, not a cloud in the sky. The field next to the pond where we were fishing was full of sunflowers. I took my iphone and took maybe 20 photos of the sunflowers, and then I turned and saw the light in the field. I have taken numerous photos of angels around my home and studio. This was the first series of photos like this that I have taken outside of my home and studio. I wish I could show you the camera roll from my iphone because it’s quite remarkable. Sunflower, sunflower, sunflowers, BOOM. I emailed them to my friends who are healers and the verdict is unanimous. “Your angels are following you around,” they say. As I saw the light, I kept snapping and took a total of eight photos just like this one. Then I turned and took a photo of another wildflower blooming close to the ground. Somehow, I personally need all this affirmation. I channel my angels virtually every day and I write down in my journals what I hear. They give me guidance and advance warning about many subjects I would have no other way of knowing about. Being able to see them in photographs still astonishes even me. 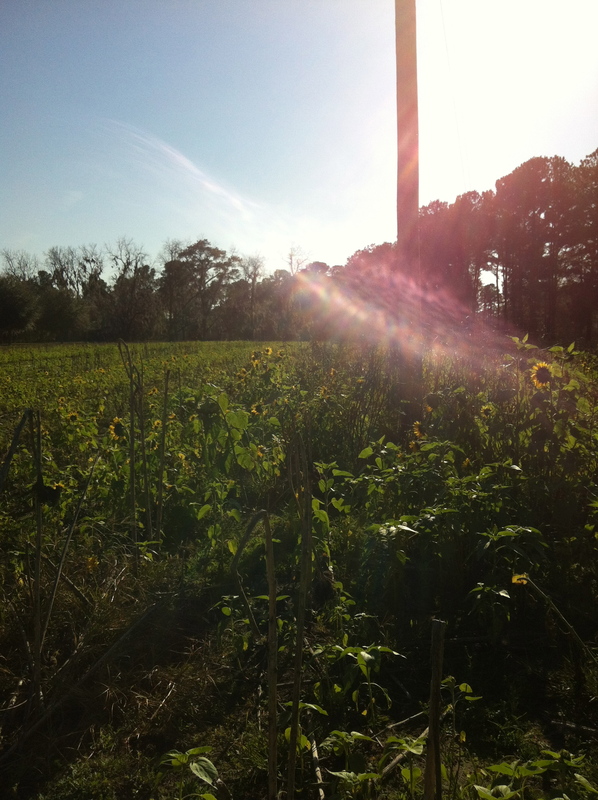 Photo: South Carolina sunflower field, Dec. 24, 2011.